As any regular reader (or anyone looking at the display of most-used tags will see), I’m a big fan of Marvel and the MCU world they’ve been building for the last eight years. I’ve enjoyed all the movies — by the way, did you read my review of Civil War yet? — and have watched all the TV shows as of now (though I am still a few episodes behind on Agents of S.H.I.E.L.D.). Regular readers might also remember a post from a few weeks ago saying how far behind I was in keeping up-to-date with everything and how it would be a while before I had a chance to watch season two of Daredevil. Well, the wait is over. Here is my long-overdue review of the latest edition of the MCU. Overall, I was disappointed. I thought there were some excellent parts, but the bad parts outweighed those. Punisher. The whole Punisher storyline was very well done, I thought. It captured the emotional intensity of the character, his personal code and desire for vengeance, not to mention the corruption involved in his initial origin story. I’m happy to hear that the Punisher will be getting his own show after Netflix made the announcement a few weeks ago. 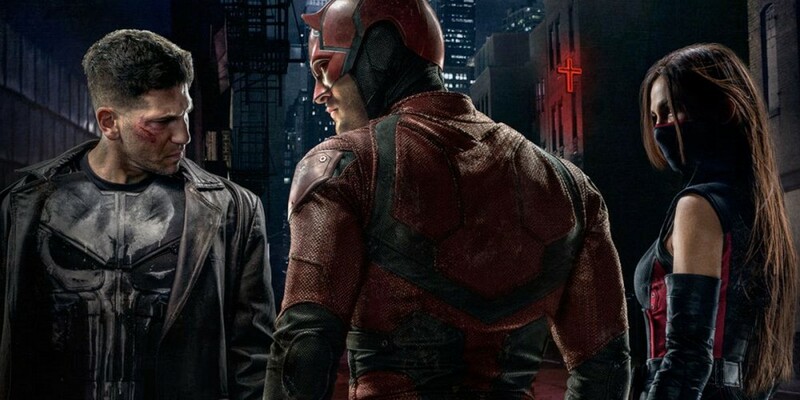 There was a great mix of gritty realism for the character that definitely showed Daredevil is not in the same light vein as the Iron Man or Avengers films (for whilst those may deal with serious topics, they also have a lot of humour and brightness. Daredevil is filmed darker and has much less humour.) It was also nice to have Frank Castle as both a protagonist and antagonist during the show — a mixed topic I wrote about during my review of The Americans. Normally I’m not a fan of anti-heroes (I can’t stand Catcher In the Rye, suffered through four boring seasons of Breaking Bad before finally giving up, never getting interested in Mad Men, etc.) but Punisher I kind of liked. Maybe it’s because he has his own strict code of justice that he adheres to. Maybe it’s because he kills bad guys like many of us wish we could. Maybe because, for him, the world is black and white whilst for the rest of us there is nothing but shades of gray. I don’t know why I like him, but I did. Crossovers. If you haven’t yet seen the series, there are a few spoilers in this paragraph, so continue reading later. If you have, or just don’t care, continue. It was great to see Vincent D’Onofrio reappear as Wilson Fisk/Kingpin in prison. It was an unexpected tie-in to season one. The Fisk character had been mentioned a few times throughout season two, but I was surprised when they actually showed him midway through the series. It was also nice to see Claire Temple again, given the way she and Matt Murdoch/Daredevil left off last season. The brief appearance of Carrie-Ann Moss as Jeri Hogarth from the Jessica Jones series was a fun addition, too. That, more than anything, helped bring the two shows closer together, and definitely has possibilities for the upcoming Luke Cage and Iron Fist shows, not to mention The Defenders miniseries. Though, for more on the topic, read below. The Rest of the MCU. Despite what I just wrote about the Daredevil/Jessica Jones connections, I was once again disappointed with the association to the rest of the MCU. For as much as I have loved the films, the shows are failing in their part to feel part of the wider world that makes up those films (just as the films are letting down the TV shows by failing to acknowledge them, for the most part. Read last week’s post for more). Outside of the ‘Crossovers’ portion from above, there was almost no reference to anything else related in the MCU. There was talk of the mysterious Roxxon Corporation, which had briefly been mentioned in season one of Agent Carter, but almost nothing else. Charlie Cox, who plays Daredevil, has suggested he’d be open to appearing in some of the movies, expressing disappointment that he wasn’t in Civil War (though maybe he’ll be in the Avengers: Infinity War movies?). In a world where S.H.I.E.L.D. is keeping tabs on crime fighting, the Sokovia Accords were just introduced, where a massive army of AI destroyed a city and even where a man with the power to (supposedly) manipulate people’s minds was recently killed in basically the same neighbourhood, Daredevil felt isolated. Nelson, Murdoch, Page and the rest of the cast were caught up in their own little worlds, not paying any attention to anything else. When Karen starts researching/working at the newspaper, it would have been a great moment to acknowledge anything else about the MCU as the journalists there could be working on stories related to recent events. But no. An opportunity lost. It’s almost beginning to feel like the weight of the MCU is going to crush its own success. Maybe Marvel should have done what DC said they were doing in that the films and TV shows aren’t related to or will impact each other. That’s the way it has mostly felt anyway. Elektra and the Ninjas. Where do I even start? This whole plot arc was inane and insane. Elektra is a horrible character, with bad dialogue, no motivation and silly mysticism connections. There also didn’t seem to be any real chemistry between the actors who played Matt/Daredevil and Elektra (which can’t be said for the rest of the cast including Punisher). After the realism of the Punisher side of the season, the quasi-fantastical side-story involving immortality and a fight between sides that has raged for centuries was disappointing. It was downright boring, honestly. The constant use of ninjas felt like bad writing. They were there to fill time and space for action sequences over and over and over again. They just kept dragging it out, deflating the impact they could have had with fewer appearances. All the scenes with Elektra and/or the ninjas felt like the worst part of the third season of Arrow that dealt with the League of Assassins and Ra’s al Ghul. Literally, all you had to do was swap a few costumes and a name or two and they could have been the same show, which would be bad on numerous accounts (not least of which is because Arrow is a DC product). There were far too many ninja fights for no other reason than to have a fight. It got repetitive. Especially since you know Matt won’t kill anyone, Elektra wants to and the ninjas will fail to (for some reason), despite being master assassins and having lifelong training in such things. By the end of the season I was bored. Unfortunately, I thought there was more bad than good in season two. I would have much preferred a Luke Cage series before this disappointing second outing. I would also like to know where The Defenders miniseries is going to play into everything, and how they’re going to fit into the Infinity War movies that will reportedly have 67 main and secondary characters. Time will tell if Marvel has finally overstepped. But I wonder if this could be the beginning of the downfall. I hope not, as I’ve enjoyed the build-up too much, but the seeds have possibly been sewn. This entry was posted in Popular Culture, Reviews, Television and tagged Agents of S.H.I.E.L.D., Captain America, Civil War, Corruption, Daredevil, Elektra, Films, Jessica Jones, Marvel, MCU, Popular Culture, Punisher, Super Hero, Television. Bookmark the permalink.